The weekend before Halloween, we made a trip out to see my brother G., who just happens to live in the land of farms and pumpkin patches. 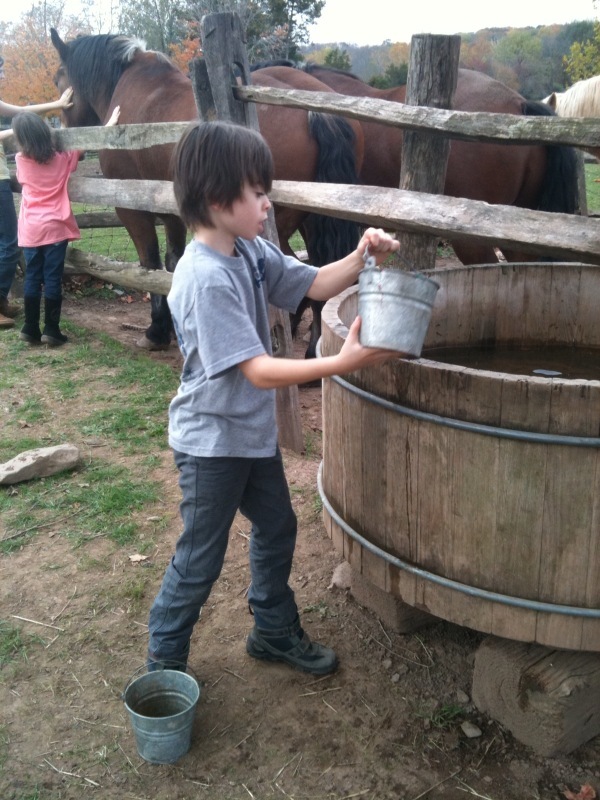 It is somewhat surprising to find that in less than an hour and half from Jersey City you can be surrounded by, clucking chickens, oinking piggies and horse manure, but indeed we were. We arrived at my brother's house and quickly started out on our adventures. Our first stop was a pumpkin patch, which we spotted along the way. There Izzy selected a 75 lb. pumpkin to adorn our front stoop. Luckily S. managed to help us take it home! Our outing continued with lunch and shopping at the Stockton Market, which holds a treasure of tasty comestibles, including local meat, dairy, vegetables, soaps and more. My brother supplied me with yogurt, eggs and other goodies from the market while I was sick and it felt good to finally be able to shop there myself. I even got to meet the folks from Flint Hill Farm, who supplied the luscious yogurt my brother delivered to me on a weekly basis, while I was ill. Their yogurt was one of the few foods that sustained mean while I was unable to eat very much. After our delicious meal and some shopping, we continued on to our final destination, the Howell Living History Farm, where my brother G. and his wife M., had spent many a day with their own children. It was a glorious fall day and the foliage viewing added additional beauty to the experience. Izzy and I were both entranced by our surroundings. We could not get enough of the country life. To begin with, the chickens were awfully compelling. 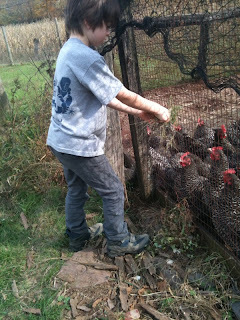 Izzy took great pleasure in feeding them greens and listening to the sounds of their clucking. 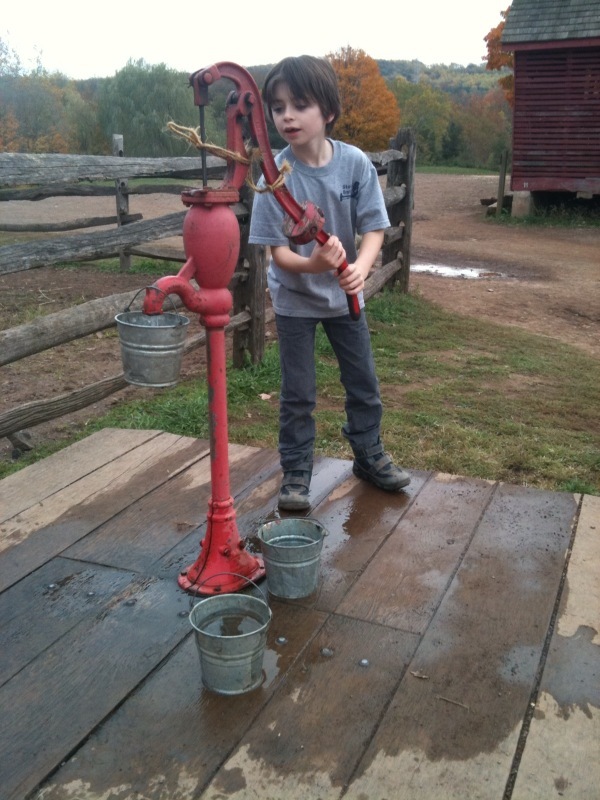 When he tired of the chickens, he spotted this red-handled water pump. now so it was nice to come and get a taste of what life was like so long ago. Pumping the water proved so exciting for Izzy that it was difficult for us to get him to go elsewhere. We did take a break to remove dried kernels from the corncobs for the pig feed - watching them laze about in the mud was also stop on our tour - but what finally managed to draw his attention away from the well was going to see "Daisy" the resident milk cow in action. I personally found this to be the highlight of our farm visit. 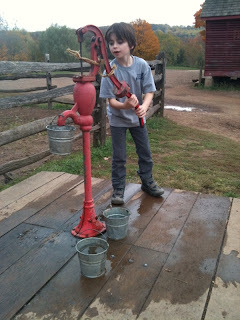 I was positively giddy with excitement as I watched the milk spurting into the pail. I even asked the farmer for a turn but apparently visitors are not permitted to touch the teats! Oh! I did wish to try the milk but alas, that was not permitted either. After Daisy was walked back to her pasture, it was time to leave so as to have time to visit the farm's corn maze, located a ways down the road. Izzy had been looking forward to it all that day and he couldn't have been happier. This large and well-conceived maze, took about an hour to navigate, by which time I was completely worn out, Izzy completely content. We all piled back into the car for the trip to Uncle G,'s house and then home. Izzy already looking forward to his next trip to the farm. Those are some really nice pictures!